Double colour video monitor installation, silent, looped, dimensions variable (the work should be shown on 2 x large identical flat screen 55"/138cm monitors, wall mounted, one above the other/touching). 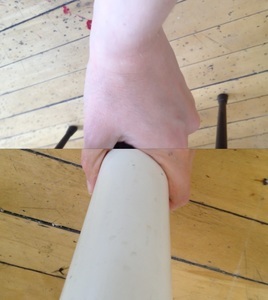 A hand lightly grasps the arm of a chair or leg of a table and constantly moves, up and down. The work explores experiencing objects through the senses - in this case primarily touch, as well as sight (& sound). There is an undoubted underlying sexual inference to the action. The act of holding onto furniture came from looking at the points of contact between the body and its support in our recent project, Re-hang, an installation of inverted life paintings. It also relates to previous work with scaffolding poles (in Osborne St Gi & CCA residency). The title, Handheld, refers to the body, furniture, mobile phone (camera) and co-ordination: Looking / feeling; Seeing / touching; Left handed / right handed (a reference back to our early video pieces Dual and Autograph). Using the structure of repeated loops, on a joined pair of monitors, the images are always in motion, disorienting and unnerving the viewer.